A few weeks ago Go Set A Watchman, the sequel to To Kill A Mockingbird and the original manuscript that the aspiring author Harper Lee presented to her publisher in the 1950s was published and released after being presumed lost for over 60 years. The announcement of the finding and subsequent publication of the manuscript, which had spawned one of the most iconic books of all time, understandably received a monumental build up in the literary world. The climax exploded early on publication day and by 7 am when I got up reviews, comment and articles abounded across every media channel you can think of. Not wanting to have the book ruined for me by overhearing any discussions or glimpsing a headline that might inadvertently change my reading of it, I went to my local bookshop, waited outside in the rain for it to open, purchased said title then holed myself up to read it cover to cover in one completely undisturbed and screen free day, and let me tell you friends it was a total joy. Having finished it I guess I could now read all the reviews and comment I liked, but actually I’ve felt no need. I can imagine pretty much what they’ll be saying and while I digest the book and everything it has to say about 1950s America, the changes in society since and the way it made me think about how the world and humanity is changing beyond all recognition, I want to keep hold of my own personal experience of the story for as long as I possibly can. My stolen uninterrupted day of reading got me thinking about stories, what they really are and what function they serve for us humans. Stories were the very first means by which people transferred their skills, shared their beliefs, continued on their traditions and passed down their histories. As soon as drawing and writing came along these stories were transcribed, greatly treasured and fiercely protected. Stories form the basis of religions, inspire action and help us gain a better understanding of ourselves and the world around us, but apart from the fabled and world renowned stories that exist within every culture, what I find so beautiful and fascinating is that each one of us also has our own unique story to tell. Stories are the maps of our lives, each one textured by our varied experiences and ideas, enriched by individual feelings, our hopes and dreams and the decisions we make. If the richness and fundamental nature of humanity is not illustrated by the existence of the story then I don’t know what does, and as Philip Pullman so potently puts it “Stories are the most important thing in the world. Without stories we wouldn’t be human beings at all” and he is a great human being who I happen to think is absolutely right. So in true followthebrownsigns style (the only style I know) I wanted to further my ponderings by visiting a museum devoted to the subject of the story. I’ve already been to the excellent Roald Dahl Museum, the fantastic celebration of storytelling that is Mythstories and although I am yet to visit, have only heard great things about The Scottish Storytelling Centre, but what I really needed was to delve into the history and nature of the story as a concept. Luckily it didn’t take long for me to discover the exciting looking Story Museum in Oxford, which only opened its doors in 2009 and being a mere 70 miles away made it just about possible to hop in the car to get there and back before my shift in the pub at 5pm. I would no doubt be surrounded by hundreds of children doing all sorts of creative story-related activities and as usual I’d stick out like the 35-year-old-lone-museum-visiting-wolf I truly am, but hey ho this is my world and I’ve become used to it’s peculiarities (even if other people haven’t) so off I set. It was a hot day and like me billions of drivers had taken to the highways and byways to find somewhere nice to enjoy it, so after coming off the M5 at Cheltenham my journey just got slower and slower. My route to Oxford took me through the Cotswolds where there’s no way you can expect any sort of quick mileage, but it was approaching a pleasingly Cotswoldy town that my journey was about to slow down rather more dramatically, well in fact in came to a complete stop. 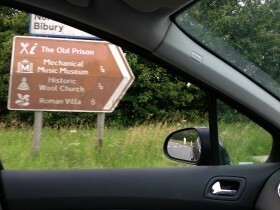 And that, dear reader, was because I spotted this brown sign. OK it’s not very easy to make out due to the speedy drive-by nature of my photography but what I saw, sandwiched there between the delights of a mechanical music museum and a Roman villa was a symbol I have only ever seen on paper, never in the flesh. That symbol my friends is that of a praying knight which signposts the way to a place where one can do brass rubbing. That’s right, BRASS RUBBING! Obviously I made the no-brainer decision in a split second to turn off the road and follow that symbol. 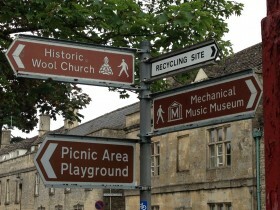 Luckily in the little town of Northleach I came across another signpost which I could take a less hastily composed photo of…. The fact that there’s a dedicated brass rubbing symbol for use on brown tourist signs has always intrigued me more than the presence of the other 92 more obvious symbols. After all the activity of brass rubbing isn’t exactly a well-known pastime, even here in Britain where our various eccentrics widely engage in other such niche activities such as train spotting and metal detecting and there aren’t dedicated symbols for those (more to the pity). Brass rubbing did used to be a much more popular pastime than it is now, unsurprisingly especially during the Victorian age when the search for knowledge and interest in history was becoming more accessible to the masses. Monumental brasses were once the in thing to have commissioned on one’s death, especially during the 13th through to the 17th centuries in Europe when it was believed that a dead person’s soul would speed much faster through purgatory if those in the land of the living prayed for them. 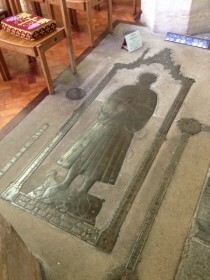 It was hoped that the sight of a monumental brass in church would motivate passers-by to offer a prayer and thus allow the deceased to pass into heaven as quickly as possible. Many monumental brasses would also be accompanied by a substantial bequest for church upkeep, cementing the brass commissioner quite firmly at the centre of the church and in the community forever. Unsurprisingly over the hundreds of years since many monumental brasses have become worn, broken and destroyed for reasons including “wanton damage” and world wars, but more often the brasses have simply become worn due to constantly being walked over and being given little conservation. Thus the late 19th century saw a significant effort to record and track the number and condition of the thousands of monumental brasses still intact across Britain. These projects were undertaken by specifically formed societies such as The Oxford Architectural and Historical Society and the Cambridge University Association of Brass Collectors (which later became the Monumental Brass Society), whose members travelled far and wide to rub as many brasses as possible and amass collections. The Monumental Brass Society has just teamed up with Birmingham University who are a significant way through formally cataloguing their collection, other collections are held at museums such as the Ashmolean where, although not on general show nor even available to view for research purposes in the interests of conservation, interested parties (that’s me and you) can have a look at their huge online collection here. The appeal of brass rubbing lies not only in the semi-artistic nature of rubbing a crayon over a surface to reveal a picture but also to discover history and the ways of our ancestors, or poetically put in this video clip from 1952 “slowly resurrecting a spirit from history”. Brasses can be used to explore everything from ladies dress in medieval times to heraldry and battles of the civil war. Intricacies cast in brass all those many hundreds of years ago have become a significant research tool for historians which even today are telling us new things about how the world was before now. Of course you don’t have to be a historian to appreciate them, you could for example be a star in the 1960s Avengers series who just happens to really like rubbing brass in random churches when she fancies escaping the humdrum of the showbiz world, randomly you can click here to see actress Ingrid Hafner doing just that in a British Pathe clip (with inclusion of the obligatory horrendously sexist remark made by the narrator at the end, but let’s be honest these old clips wouldn’t half be as hilarious without them). Nowadays it’s unfortunately no longer possible to rock up with a scroll of paper under your arm, crayon in hand and start rubbing away on nice looking brass on any old church floor. 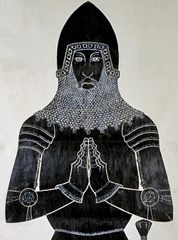 The art of brass-rubbing is now mainly confined to the rubbing of specially made replica brasses at dedicated centres like The London Brass Rubbing Centre (in the crypt at St Martins in the Fields, Trafalgar Square) and in churches with brasses that are deemed in good enough condition to be rubbed. These are however few and far between, so you can imagine my excitement when I saw the symbol of the praying knight at Northleach and the thought of being able to go and rub some actual old brass in an actual old church. 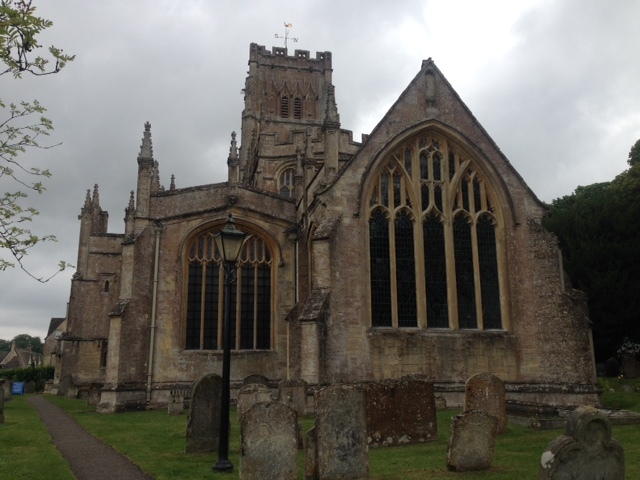 I followed the sign up to the “Cathedral of The Cotswolds”, the church of St Peter and St Paul, and hung around for a bit in the porch feeling a bit weird about going in (do all non-Christians feel like this before entering a church? ), but finally turned the massive cast iron door knob and entered into a light and welcoming space. Assuming I would be alone as is most often the case on these spontaneous visits I was surprised to be approached by a smiley chap holding out a printed out laminated information sheet telling me about the church. I didn’t want to look too preoccupied by the thought of rubbing some brass but after the usual talk of building dates and materials I could contain my excitement no longer and enquired about the church brasses. The chap (who it turned out was called Bill) eagerly took me over to the monumental brasses which had been commissioned by local businessmen who had made their fortunes from the wool trade during the 15th century. During this time in England’s history it cannot be underestimated how important and lucrative the trade in wool was, it was called the “jewel of the realm” and funded battles, campaigns and even paid Richard the Lionheart’s ransom after being captured while returning from the Crusades. 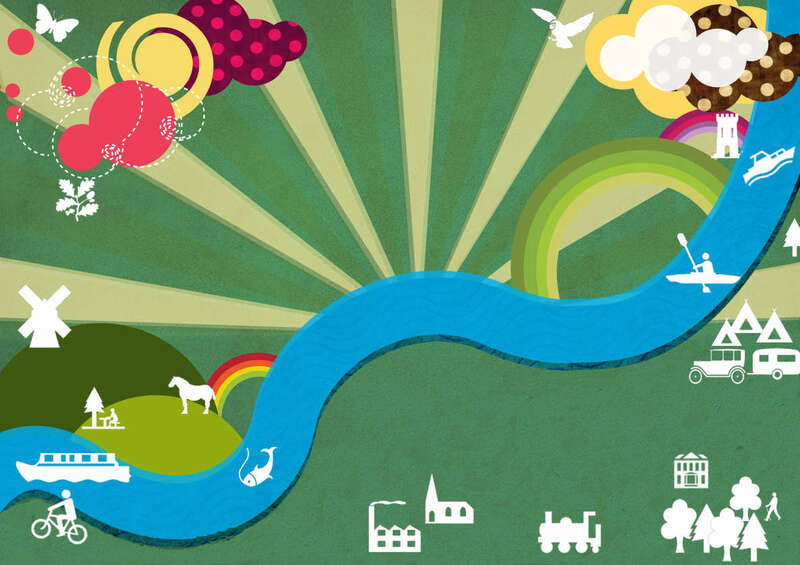 Cotswolds wool was deemed to be of the highest quality and as such the unassuming village of Northleach quickly became quite the wooly powerhouse. 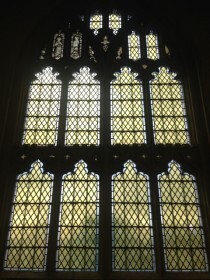 Merchants and businessmen who were involved in the trade locally were known as “woolmen”, and it was one such woolman, John Fortey, on his death in 1459 who left the huge sum of £300 to the church at Northleach to extend and bring in more light through the addition of windows and also commissioned his own monumental brass. Bill and I talked about the brasses for a while and tentatively I asked if it was possible to rub one but quick as a flash he said no. These brasses were already pretty damaged through general wear over 500 years and it was thought that rubbing them now would only make them worse. Bill and I chatted some more and I dutifully looked up at the bright windows trying not to feel too despondent, and even took a photo of the only window left with some mediaeval stained glass panes left intact (the few in the top left corner). After a bit more pootling about I thanked Bill for his time, signed the visitors book with my usual “Life’s more fun when you followthebrownsigns.com” and went off to explore the graveyard. About 15 minutes later Bill came out of the church and was delighted to see me still hanging around like a weirdo and excitedly took me around to one of the church walls which used to have a sundial on it. Not much was left of the sundial but Bill was very excited to describe how people would have told the time from it before the age of clocks. It turned out he’d finished his few hours volunteering for the day and we walked down back down to the market square together, talking mainly about the preservation of graveyards. He recommended I went for some lunch at the Black Cat cafe where he often got a tuna sandwich for his lunch. He was a very nice man. 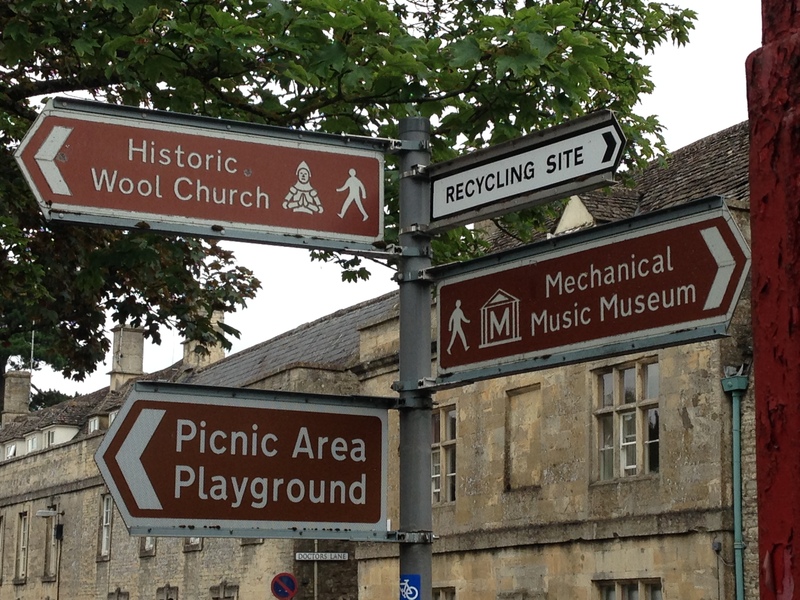 My detour had lasted over an hour and although my visit to Northleach had been interesting it had not produced the brass rubbing experience I’d hoped for when I first spotted that praying knight on the brown sign. So I sat in the car park in my boiling car trying to decide if I could still make it to Oxford to follow the original plan to go to the Story Museum, but even I, the person most able to fit as much as possible into any short space of time had to admit it would be pretty tight for time. I turned around back on the road I came from and made it back just in time for work.